Late Autumn is truly here. The two olive trees in my front yard are heavy with darkening fruit, and now is the time to harvest them and get busy preserving olives. To me, there is something romantic about olive trees. Even my two lonely olive trees standing by the road. I had always wanted to preserve my own olives, but it sounded pretty scary to me. Did you need special olives? I inherited my trees and had no idea what variety they are. Are they only ornamental? Does it matter? 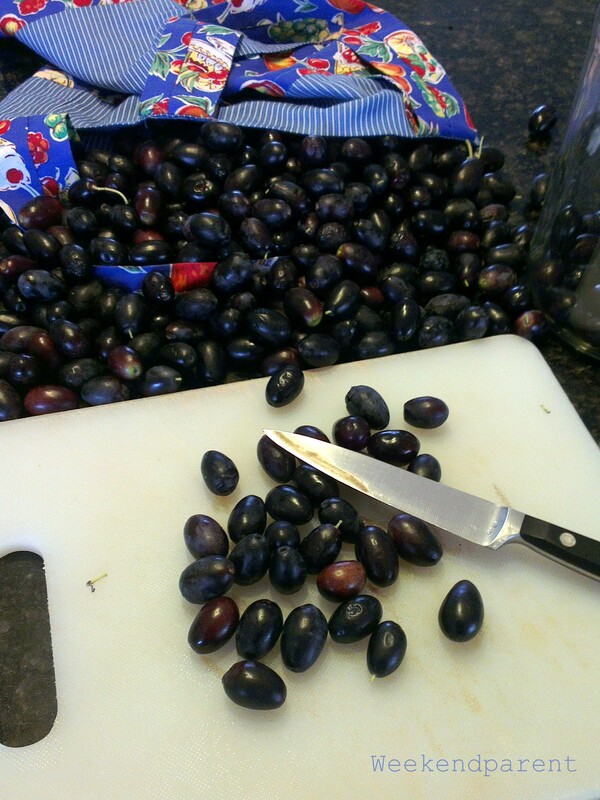 Last year I decided to have a go preserving olives, using an information sheet from Burke’s Backyard. It was not a good harvest year for my olives; there had not been much rain when they were flowering and only one tree produced fruit, and they were tiny. Still, I figured I may as well experiment. My olives were small and definitely not prize-worthy, but they were edible. I liked them a lot, actually, and so too did my Dad when I pulled them out one night for snacks to accompany his homemade red wine. Or maybe it was just the truth juice (as we like to call his home brew). So this year I am making more olives. Little A has had lots of fun helping Mummy pick olives. Of course he can’t reach the high ones, but he can reach the low ones. I have contemplated, after spending literally hours preparing the olives and changing the water daily, that I really must to truly frugal to spend this much time preparing the olives when I don’t know if it will be worth it or not. I hope it will be. But while time consuming, it was not that hard. I put on some good music and got into the zen appreciation of preparing such cute round olives, and I was done in no time. I have relied pretty much on the Burke’s Backyard method. But for an alternative, prize-winning recipe you can see the lovely lemon preserved olives at Bizzy Lizzy’s Good Things – they look so pretty. 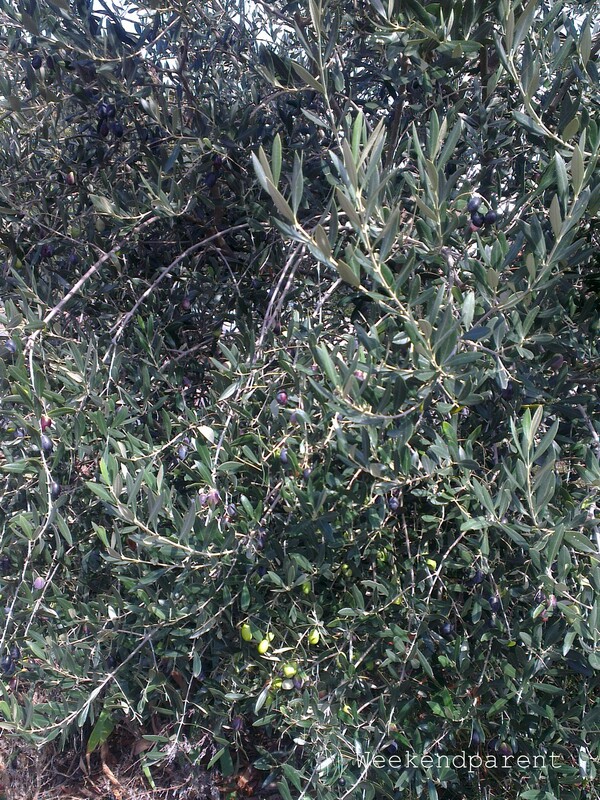 Harvest the olives. I like black olives, so half of my issue was getting olives that were fully ripe but that had not yet fallen to the ground. The best ones always seemed to be just that far out of reach. 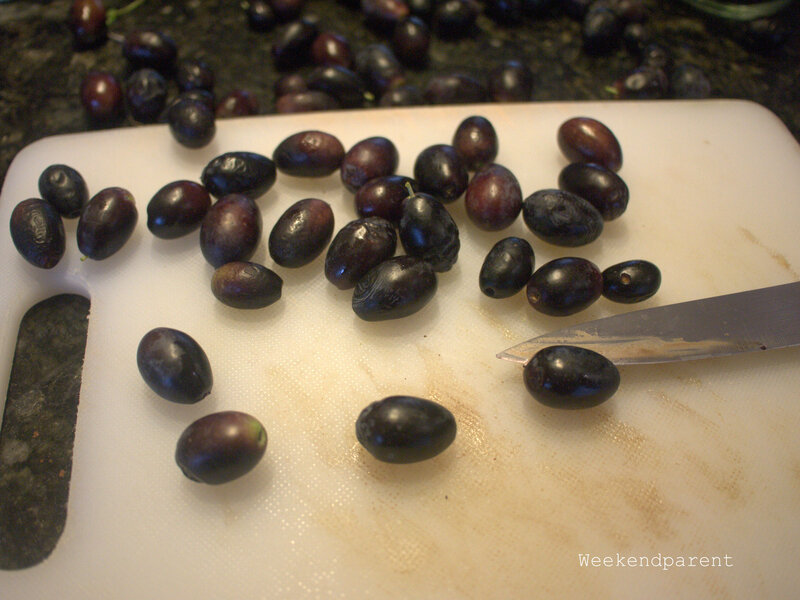 Cut a small slit into each side of the olives (i.e. two per olive). Place into a glass or other container, and cover with water. Burke’s Backyard recommends putting a plastic bag filled with water on top to ensure that all olives are fully submerged (some like to float to the top). Change the water daily: soak four days for black olives, six days for green. There might be some scum on the surface and you might notice a bit of a sour/bitter smell. This is normal. I also found it a bit strange that the water after the first day was totally black, presumably from the olive skin. After soaking the requisite time. Bizzy Lizzy recommends trying one of the olives to see if they are still bitter or not. Wash and thoroughly sterilize glass jars. Being frugal, I have a variety of odds and ends and also some nice ones that people gave me. I don’t think it matters much, so long as they are clean and you can seal them reasonably well. Prepare a brine solution. Burke’s Backyard recommends approximately 1/3 cup of salt to each liter of water. He also recommends heating the brine solution in a saucepan until dissolved and waiting a few hours to cool. Poor the brine solution over the olives in the jar, top with olive oil then seal. Place in a dark place for six weeks, after which they are ready to eat. If you would like to make fancier marinated olives, you can remove from the brine mixture, cover with olive oil and add flavourings (e.g. lemon, rosemary, chilli, garlic etc). I haven’t tried this before but I reckon I will have a go this year. What a great post! I’ve wanted to preserve my own olives for years. I gave it go a few years back with some terrible results. Should I have a chance to try again, I’ll be back to re-read this! I love your work! Thanks. I had expected my olives last year to be awful, so was pleasantly surprised they were okay. Fingers crossed they will turn out okay this year. Thanks Serina for the shout out! 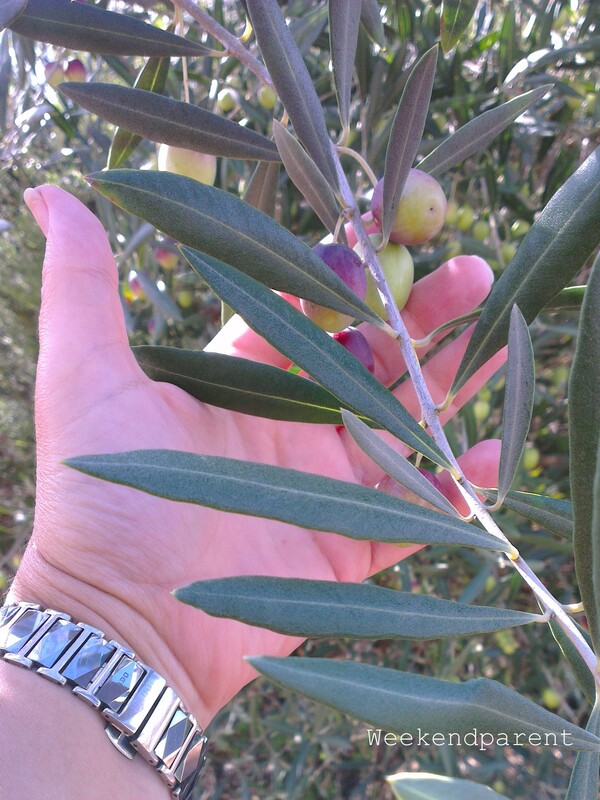 I was so happy to have harvested twelve olives that year! It was a good one… and the preserved olives were lovely. Great post. I look forward to meeting you this week. I’m sure your olives were delicious. I liked the addition of lemon.